All of US 66 in Arizona is bypassed by I-40, but there are still large drivable segments of it. You can get off I-40 at Ash Fork, and not rejoin I-40 until you reach the Colorado River, with the exception of a couple of miles south of Kingman. 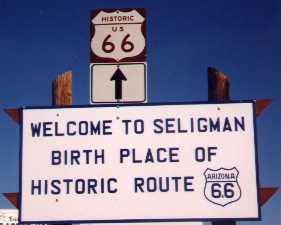 From Seligman to Kingman, it's designated Historic AZ 66. I-40 bypassed most of the towns, leaving the old US 66 segment as a business loop. 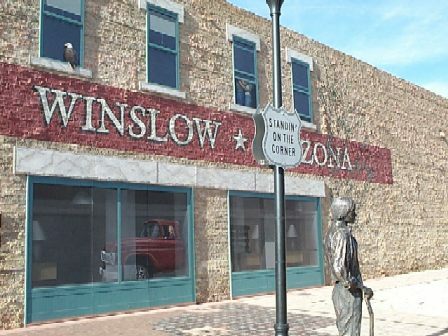 These loops are generally marked with the Historic US 66 marker, along with the Business I-40 markers. Route 66 tourism is a big deal along the old corridor, although I'm not sure I believe this claim. 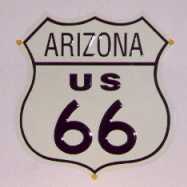 Arizona has marked most of the exits off I-40 with a Historic 66 marker. 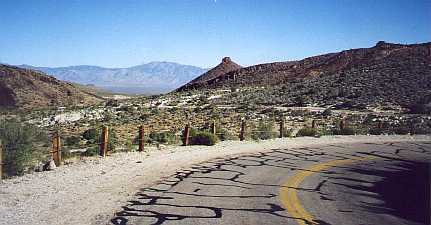 Some maps show the segment from Kingman to Topock via Oatman to be gravel, but it is actually paved. It is however very narrow and winding, so think twice about taking an RV this way. US 66 was rerouted in 1953 along the current flat I-40 alignment. I'm not sure why it took the "hard way" when it could have just followed the Santa Fe railroad like it does throughout most of Arizona. The Bureau of Land Management has designated the Kingman to Topock leg a National Back Country Byway. 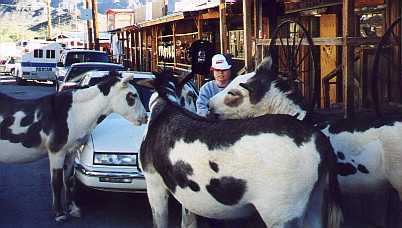 Despite the bad road, Oatman still gets a lot of tourists, lured by the Old West, old US 66, and wild burros. The burros are feral descendents of miners' burros. They don't have to haul packs any more, just beg tourists for carrots and apples. 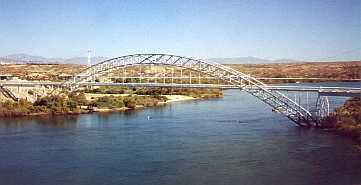 The 1919 Old Trails bridge over the Colorado River. It's now being used as a gas pipeline bridge. The first crossing was the Red Rocks rail bridge built in 1890. Cars would cross on the bridge between trains, which was obviously very risky. The Old Trails bridge was built in 1919. In 1947, a new rail bridge was built and cars took over the old Red Rock bridge. In 1966, the I-40 bridge was built. Finally, the old Red Rock bridge was demolished in 1978. You can see some pictures and maps at Casey Cooper's US 66 page. 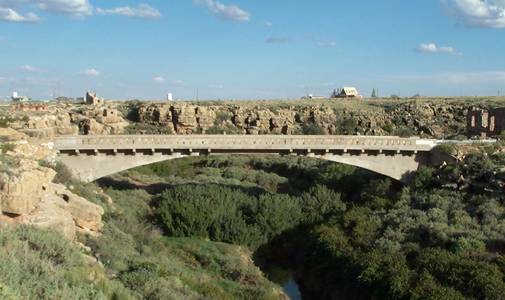 Original US 66 bridge over Canyon Diablo, at Two Guns. 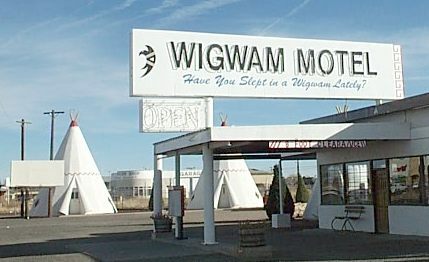 In Holbrook, you can sleep in a concrete teepee. 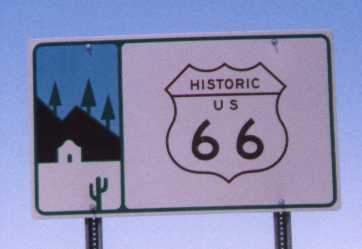 Arizona had the last segment of US 66 to be bypassed by interstate, at Williams. US 66 is probably the best known and best documented highway in the US, so I can't do it justice here. 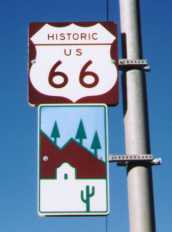 You can check out the Route 66 homepage for lots of info and links. There's also a Route 66 Magazine.